ABB Australia reinforces its technology leadership with the launch of new 420 kV high voltage hybrid switchgear. Part of ABB’s PASS (Plug and Switch System) family of hybrid high voltage switchgear, the latest 420kV range integrates the functions of a circuit breaker, disconnector and earthing switch as well as current and voltage transformers in one product, which is pre-assembled and factory-tested to save on installation and commissioning time. The high voltage switchgear facilitates switching, control and protection of power networks across voltage levels of 50 kV to 1200 kV. 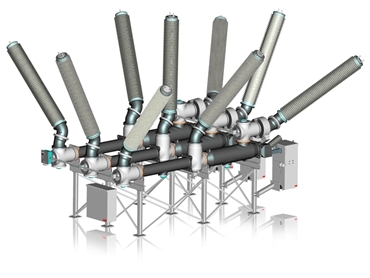 The simple, safe and innovative design of the high voltage hybrid switchgear enables the bushings to be rotated from service to transport position and vice-versa, taking less than 30 seconds for each bushing. The switchgear module’s compact design can help reduce the footprint of the switchgear bay by up to 50 per cent when compared to air insulated switchgear with comparable ratings. Maintenance on the new ABB high voltage hybrid switchgear can be carried out during service without any outage or downtime, as there is no need for regular cleaning of the switchgear contacts since all active parts of the equipment are gas insulated. This also reduces the time and cost of servicing the equipment in addition to enhancing its reliability and availability. With the introduction of the new 420 kV module, the PASS product family now covers voltages from 72.5 kV to 420 kV with breaking current capability ranging from 31.5 to 63 kA. In addition to standard modules a special solution called the PASS M0 H offers a complete high voltage switchyard with an ‘H’ configuration as a single product. Giandomenico Rivetti, head of ABB’s High Voltage business, a part of the company’s Power Products division comments that ABB offers a wide range of hybrid high voltage switchgear solutions to suit varying customer needs with the new compact and highly reliable 420kV PASS complementing their existing GIS based ELK hybrid technology. He adds that the innovative design features of the new product enable ease of transportation, and quick and simple installation.